Change Direction Or "Stay The Course"
The House Democrats have given the country a clear choice. A sharply divided House voted Friday to order President Bush to bring combat troops home from Iraq next year, a victory for Democrats in an epic war-powers struggle and Congress’ boldest challenge yet to the administration’s policy. Ignoring a White House veto threat, lawmakers voted 218-212, mostly along party lines, for a binding war spending bill requiring that combat operations cease before September 2008, or earlier if the Iraqi government does not meet certain requirements. Democrats said it was time to heed the mandate of their election sweep last November, which gave them control of Congress. 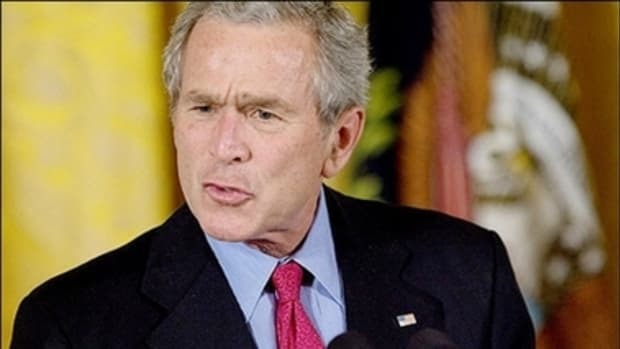 Bush will veto it, which puts it along stem cell research as the two policies this presidency will show some gumption on - keeping this unnecessary war going and stopping research that saves people&apos;s lives. The only way out is a Democratic president. ALSO: I want to point out that the advice trolls were trumpeting "Democrat disarray" yesterday when the Dems were doing what all congressional leadership does - rustle up votes, and like the proclamations earlier that 1) Nancy Pelosi wouldn&apos;t be elected speaker by the new "conservative" Democrats and 2) After getting Hoyer over Murtha as Majority Leader she wouldn&apos;t be able to pass legislation they turned out to be wrong, once again. "Fundamentals Are Strong" Is The New "Stay The Course"
But Will The Democrats Listen?